News from Canexus today indicates that it is only getting worse for the Bruderheim terminal. A major customer has terminated its contract. Now only 40% of capacity is under contract. But not even that is being used. Last week, the 100,000 bpd capacity terminal loaded only 13,200 bpd. The issue of whether significant quantities of tar sands crude will move by rail if projects such as the Keystone XL tar sands pipeline are not built is a major part of the ongoing debate about tar sands expansion. 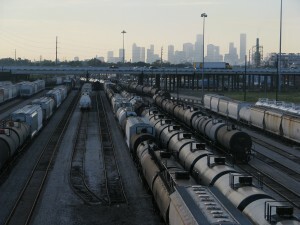 The assertion that rail is a viable alternative to pipelines to the Gulf Coast is important for tar sands proponents because any claim that Keystone XL passes the President’s climate test rests on the weak argument that carbon intensive tar sands crude will be developed at the same rate with or without the massive pipeline. This is the first in a series of blogs discussing and building upon the evidence presented in the Oil Change International report ‘Wrong Side of the Tracks’. The report details the challenges the Canadian tar sands industry faces in getting its dirty product to market via rail in the face of ongoing pipeline delays caused by rising public opposition to tar sands production and related pipelines. In today’s blog we look at the ongoing underperformance of the first unit train loading terminal in Alberta with access to tar sands crude. It is a tale of budget overruns, missed targets and operational failures. Many observers hailed the beginning of unit train shipping for tar sands crude as a new era in which tar sands producers could use North America’s existing rail network to circumvent opposition by environmentalists and indigenous communities. But almost one year after the first tar sands unit train facility was completed, tar sands unit trains are limping along and the rush of tar sands crude they are supposed to deliver is yet to materialize. Far from proving the economic viability of tar sands by rail, the first companies to experiment in this sector have encountered operational issues, high costs and low returns. The crude-by-rail boom started in North Dakota, where producers demonstrated the economic feasibility of shipping light crude by rail via unit trains. Unit trains are loaded as a single unit, generally of between 80 and 120 cars, delivering their cargo to a single destination with lower costs than having a train carrying a variety of freight cars pick up and deliver those cars via various switching yards. By 2013, North Dakota’s oil producers had built fifteen crude-by-rail terminals with over one million barrels per day (bpd) of capacity. By comparison, the tar sands industry had been very slow to adopt crude-by-rail. However, in the face of severe pipeline bottlenecks and delays, companies began looking for ways to replicate the crude-by-rail boom in North Dakota and ship diluted bitumen (dilbit) by unit train. In mid-December 2013, a little known company – Canexus Corp. – got ahead of the game by opening the first unit train terminal with access to tar sands crude in Bruderheim (near Edmonton), Alberta. The week the terminal began loading its first train vice president Jamie Urquhart told Platts Commodity News, “our aim will be to transport about 62,400 barrels per day diluted bitumen during the first phase and increasing to 98,100 bpd by July 2014 through increasing the number of trains to 11 a week”. In its environmental review of the Keystone XL pipeline, the State Department claimed that Canexus had contracts to ship 150,000 bpd of diluted bitumen and used the company’s estimates to support the low end of the Department’s estimate of the cost of tar sands by rail (see Section 1.4 pages 85 and 102). Since then, the terminal has faced dramatic cost overruns and has operated at only a small fraction of its capacity. Construction ran 60 percent over budget jumping to CAD$360 million. Only 60 percent of capacity is under contract – less than half of the volume assumed by the State Department. Even then the project has yet to operate at even 50 percent of designed capacity. From December to late June, loading averaged a little over 19,000 barrels per day, around 30 percent of the figure touted by Urquhart, and the highest ever weekly recorded rate was 31,000 bpd. By July, which was when the company had predicted it would be raising throughput to nearly 100,000 bpd, the terminal was shut down for a three-month overhaul. Average loadings since it restarted in September are at a paltry 9,000 bpd compared to the facility’s maximum 100,000 bpd capacity. The question of why MEG initially refused permission for Canexus to connect to its pipe remains a mystery. Could it be that MEG is getting cold feet over sending tar sands by rail? Given that throughout 2014, traders have reported that shipping tar sands to the Gulf Coast by rail is unprofitable because low prevailing oil prices do not cover the high costs of rail, this would not be surprising. The ruinous economics of shipping tar sands by rail to the Gulf Coast is described in the Oil Change report Wrong Side of the Tracks and will be the subject of a future blog in this series. What is clear is that far from proving the feasibility of tar sands by rail as an alternative to pipelines, the company pioneering this activity has proven it to be a highly risky business. 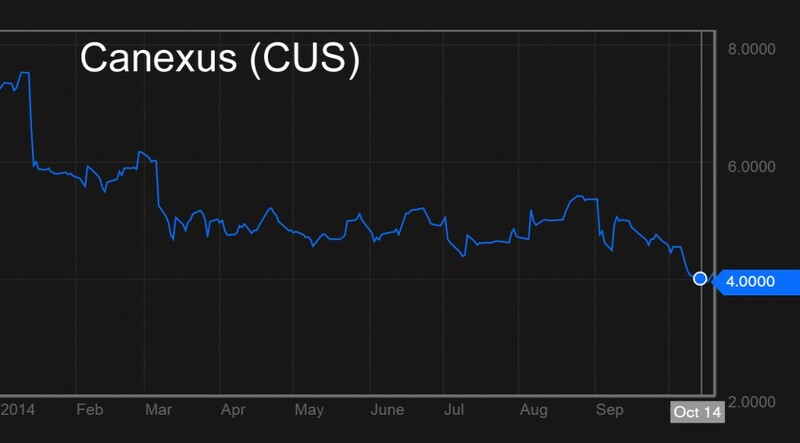 Canexus’s share price is down nearly 50 percent since the beginning of the year, it has cut dividends and replaced its CEO. It is also considering selling Bruderheim in order to revive its balance sheet and support its other core businesses. It remains to be seen whether Bruderheim will be able to ramp up loadings to anywhere near the touted figures of 60,000 to 90,000 bpd or 10 to 14 trains a week. Thus far it has only rarely loaded a single full unit train per week. Whatever the reason for MEG’s action against Canexus, it is clear that the tar sands industry’s first foray into large scale crude-by-rail has gotten off to a shaky start. It stands in stark contrast to the bubbling optimism for the trade projected in the Department of State’s analysis of the Keystone XL pipeline, which concluded that shipping tar sands by rail would be a viable alternative to the pipeline and therefore not permitting the pipeline would not achieve any net environmental benefits. The experience so far at Bruderheim clearly contradicts that conclusion. Figures from Genscape Petrorail Report, a subscription only publication that monitors activity at various North American crude-by-rail terminal including Bruderheim. Figures are reported weekly so weekly totals are averaged to barrels per day. Get your facts straight. You’re reporting isn’t hardly worth reading except to illustrate how incomplete research can cause inaccurate data from being reported as the truth. Please to more Research on the location of Heavy Oil Extraction Locations and the 3 different ways it is Transported in Northern Alberta. It doesn’t matter who misrepresents the Truth it is still wrong. This kind of response infuriates me. Loyie may have a point, but to see his point I would have to spend time researching an issue on the basis of a name. If he wants to argue against this article, which he calls a lie, he needs to offer some proof. Instead, he wants the reader to find his own proof. No, I won’t. I have to post a response to Mr. David Loyie. Dave, you want us to believe you know more than the author of this article, yet your simple five sentence paragraph is so jam packed with errors that you come off as an uneducated fool. I spot nine grammatical and punctuation errors, and two sentences that are structured so poorly, they convey the opposite of your intended message. If the author of this article needs to do more research, you sir, need to head back to grammar school. I do not understand this entire attack on the supply side of the oil industry. Give consumers a superior choice and they will choose it. Subsidies for alternative energy sources are a great idea but get off the backs of the oil producers and transporters. The oil business is actually a legal business as far as I know. Regarding Michael’s comment. Rather than assume this is an “attack” consider this research an analytical critique, an assessment of the claims of the producer’s, distributors and proponents of tar sand product. You suggest that offering consumers a “superior choice” will convince them to choose it. Very well then let’s provide that prospectus to allow consumers to understand the value of their choice. To date the accepted manner of developing and portraying such information has been solely the purview of industry analysts with close ties to the suppliers, perhaps not as independent and capable of a truly objective view. Investors get one side of the story, often a limited exclusive narrative about the virtues and value they define. Now a more comprehensive and inclusive report would contain information detailed in this article. These “externalized” costs must be considered so the consumer can make a an unbiased rational decision about what is “superior”. I know it’s not a simple answer, I know you’d like to think these details are irrelevant and why can’t we just live as though none of this were important or made a difference in our lives. Kind of like when we were children and our parents defined our view of the world. Michael I don’t think you’re a child and I expect you to take more responsibility for your thoughts. Dig deeper to understand, I know you can do it. I know we can all do it.